If you haven't heard of our free poker software program, then you're missing out. We offer a one-stop shop for you to get your hands on licenses to nearly 30 programs, and the best part is you don't have to pay a dime. No, we're not kidding. This isn't some cruel April Fools Day joke. 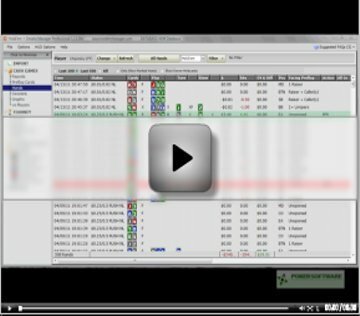 Our free poker software lineup includes several of the top poker tracking and analysis suites in the business. Take Holdem Manager, for example, which features a generous applications section that includes top-tier software like SNG Wizard and Table Ninja. You can literally use the three in tandem to improve your game. And, you can get all of them for free through PokerSoftware.com. How does it work? First, check out our most popular software choices at the top of the screen. Many of our customers elect to receive either Holdem Manager or its main competitor in the marketplace, PokerTracker. Therefore, we've listed both at the very top of this page so they're easy to find. Both weigh in at about $100 if you were to purchase them directly, but remember, you can snag free poker software through our site. Why pay money if you don't have to? Once you've settled on a program, hit the green "Get it Free" button next to it. Go ahead, don't be shy. You'll then be taken to a screen showing several online poker sites you can sign up for. Each has a different set of requirements and, after you're done fulfilling them, we'll give you a piece of free poker software. There's even a link to download. We've narrowed the hundreds of sites in the online poker world down to our five most demanded ones, and if you're from the United States, then don't worry. We even have rooms that you can sign up for. Our most popular sites are Carbon Poker and Cake Poker. The former makes its home on the USA-friendly Merge Gaming Network, while Cake Poker is the eponymous site of its own family of rooms; Cake also accepts U.S. users. If you sign up for PokerStars, the world's largest online poker site, then you'll be handed a piece of software once you log 500 FPPs. Full Tilt Poker also has a 500-point requirement and on PartyPoker, you have to log 200 PartyPoints. None of the three accepts real money U.S. players. It's important to note that if you have ever had a real or play money account on a site, then you're not eligible for it. The site must be one you've never registered for. You'll notice a red status bar that appears across the top of PokerSoftware.com if you're logged in and have a pending promotion. When you've finished the requirements for the online poker room, just come back to PokerSoftware.com, log in, and click on that giant red message. Then, we'll hook you up with your desired software. It's really pretty easy. If you're not sure which program to pick, we'd suggest Holdem Manager, PokerTracker, or Poker Office. These are the top poker database programs in the industry and will help you keep tabs on your play and the play of your opponents. Each includes a Heads-Up Display that will show stats right on the table and they should improve your game leaps and bounds right away. From there, check out programs like SNG Wizard, IdleMiner, Leak Buster, and Tournament Shark. By the way, we only allow signups on the dot-com versions of these online poker sites. If you sign up for PokerStars.fr or PokerStars.it, for example, it won't count for a Free Software promotion. Please contact us at support@pokersoftware.com with any questions about site eligibility. We've literally had hundreds of poker players get software from us, so join in the fun. If you have any questions, be sure to shoot us at email at support@pokersoftware.com. We'd be happy to help you find a piece of software that suits your needs.